I’m trying hard to only put DSLR photos on this site whilst blogging family meals that were instagrammed over at my family food site Dinner With Crayons. With a conveyor belt of cookbooks and products within reach, sometimes you don’t get to eat the same thing more than once. 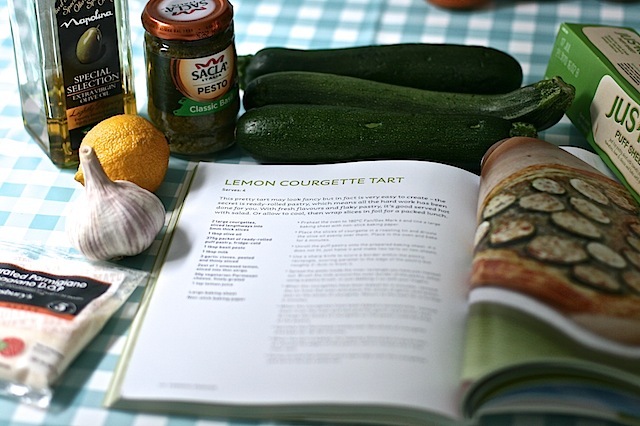 However I was SO taken with this courgette tart taken from one of my friend Charlotte Pike’s new Hungry Student books, I just had to make it again a week later and it’s entering my canon of dishes to serve vegetarian guests. Charlotte undertook a marathon last year. Not the running variety, but she produced three cookery books inside six months*. Each one contains 150 student proof recipes, around half of which are illustrated in full colour photographs. *Childcare excuses aside, you’ll not hear me whining about writing one book containing 25 sugarcraft projects in the light of this!! The books are out now and at a highly affordable £7.99 each, they’d make an ideal gift for anyone off to university fending for themselves in the kitchen for the first time. 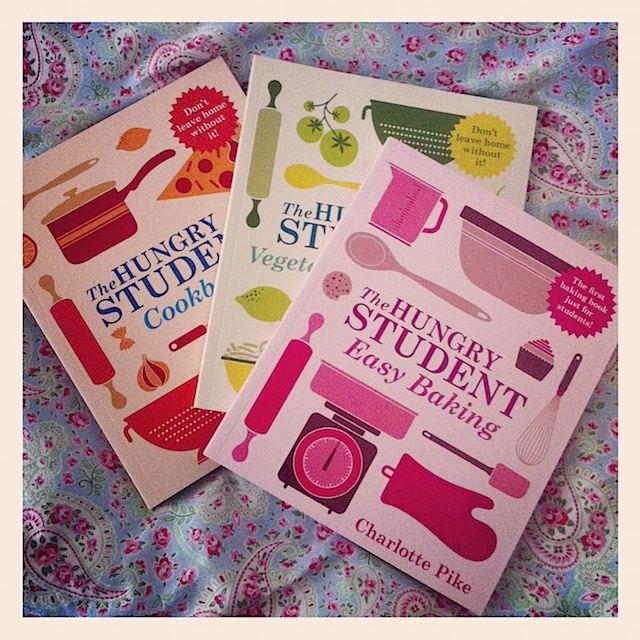 The three titles are Hungry Student Cookbook, Hungry Student Easy Baking and Hungry Student Vegetarian. I’ve even heard rumours some supermarkets are stocking the series for a bargain £3.99. So you could buy all three for not much more than a round of drinks in the student bar. I’ve cooked two recipes from the Hungry Student Vegetarian and the flavours of each of them have had distinct “yum” factor. 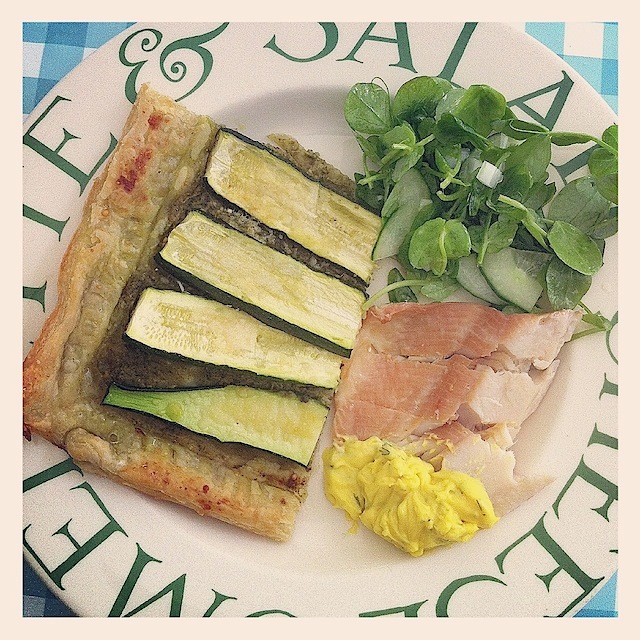 Lemon and courgette tart keeps things quick and easy by making use of bought puff pastry and bought pesto. After all, students are too busy studying (!) 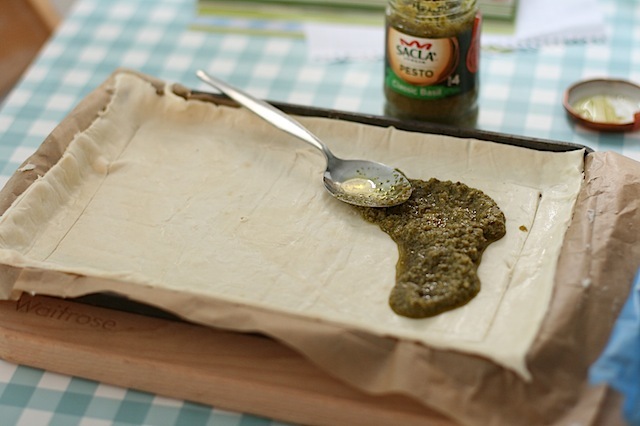 to make their own puff pastry and pesto. Possibly they’ll be cooking for themselves on a regular basis for the first time. And whilst making your own pesto is very easy, the bought varieties are spot on for quick meals and versatile enough to be used in many dishes other than pasta. I recently used the coriander pesto on lamb chops and at the weekend I used more of the classic pesto in a rice salad. You can easily get three completely different meals out of one jar of pesto so I imagine it’s very popular with students. 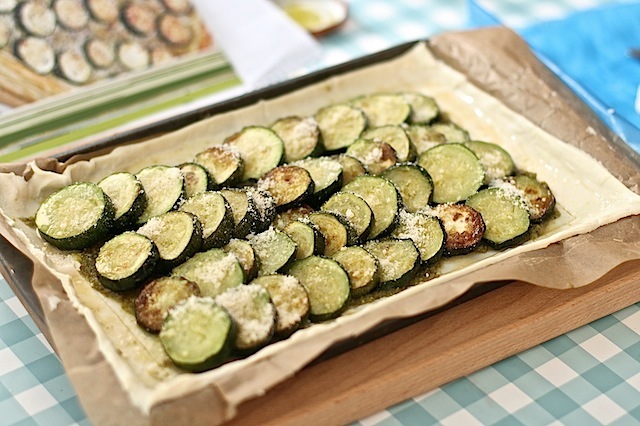 Charlotte’s recipe in a nutshell was to line a baking sheet with pre-rolled puff pastry, smear with pesto and score a one inch border around the edge of the pastry before topping with part roasted slices of courgette and a sprinkling of parmesan. Bake for around 25 minutes at 200c / Gas Mark 6 and drizzle with lemon juice on serving. Please note that since parmesan contains animal rennet you’ll need to use a vegetarian alternative to make this recipe vegetarian friendly. Whilst Ted isn’t a student yet, I’d happily (ok with a tear in my eye *sob*) pack him off to college with a set of Hungry Student books. In the meantime my hungry family will be enjoying lots more food from them. We’ve already been wowed by the lime and coconut ice cream (also in the vegetarian volume) which will be blogged in the near future. With thanks to Quercus for review copies of the Hungry Student books and to Sacla for the pesto mountain that has been featuring in many of our family meals recently – watch out for more of them as they come on my instagram account and others popping up on Dinner With Crayons. « May the Tapas Revolution commence! 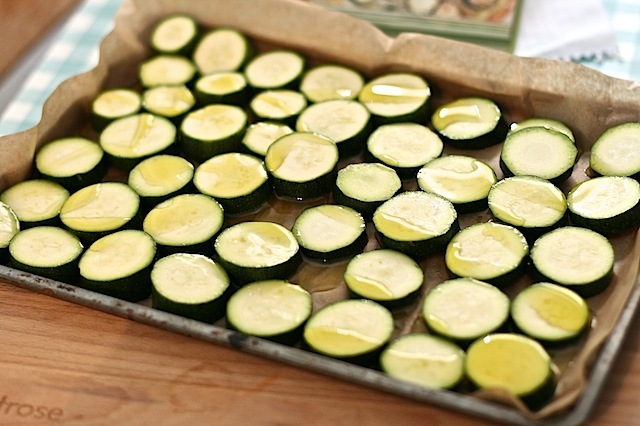 A delicious looking and sounding courgette tart! Looks delicious! 🙂 I love pesto! Very confused with all these comment options. Just realised I commented on Facebook not your blog. Anyway the tart looks scrumptious and the books are very well done.